Katz, Marshall & Banks, LLP is pleased to announce the release of the book Whistleblower Law: A Practitioner's Guide, co-written by firm partner Lisa J. Banks. Available in eBook and print formats from its publisher, ALM’s Law Journal Press, the book is a practical, comprehensive guide to the rapidly evolving field of whistleblower law and the numerous and often complex issues facing practitioners on both sides of the whistleblower bar. Ms. Banks, along with Gibson, Dunn & Crutcher LLP Partner Jason Schwartz, has written a balanced view of the law useful to both whistleblower advocates and defense counsel alike. Click here to preview the table of contents and a free sample chapter on whistleblower protections under the Sarbanes-Oxley Act. Employer considerations, including preventative measures, investigations, disclosures, privilege, and settlements. In her review of the book, Danielle Brian, Executive Director of the Project on Government Oversight, said: “As a federal government watchdog, I often work with corporate and government insiders with first-hand knowledge of matters vital to the public interest. Whistleblowers are the first and best line of defense against waste, corruption, and other misconduct by the government and its contractors. This book is simply without equal as a comprehensive, non-biased guide to the current landscape of federal and state whistleblower law." Ms. Banks also is the principal author of Katz, Marshall & Banks’ CFTC Whistleblower Practice Guide, published for the first time in 2016 and available for free download here. 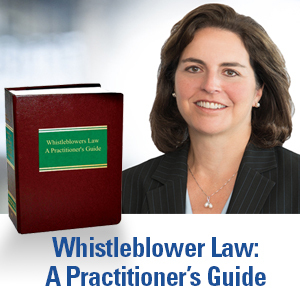 The CFTC Whistleblower Practice Guide provides an in-depth explanation of the rules and procedures concerning the CFTC whistleblower program, offers valuable practice trips for whistleblowers and their counsel, and outlines the legal protections that whistleblowers have against retaliation for reporting violations to the CFTC. Katz, Marshall & Banks also publishes and updates annually its SEC Whistleblower Practice Guide, which can be found here.